Broccoli is one of the most healthful vegetables one can eat. Yet, many people don’t like it, usually because of an experience when they were young and having to eat it when it was grossly overcooked. You can’t blame them for their feelings. When broccoli is overcooked, the sulfur compounds are released, making the house stink, and giving the vegetable a VERY strong flavor! If you’re in that camp, I urge you to give it a second try. Just don’t overcook it! Below is a video where I discuss a lot of information about broccoli including how to cook it without that strong taste that most of us don’t like. Below the video are my discussion notes. Enjoy! Broccoli is high in many nutrients, including fiber, some B vitamins, vitamin C, vitamin K, iron and potassium. 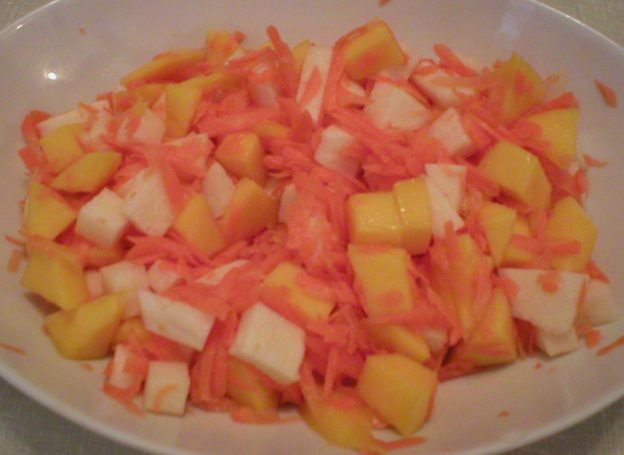 It is a good source of beta-carotene. 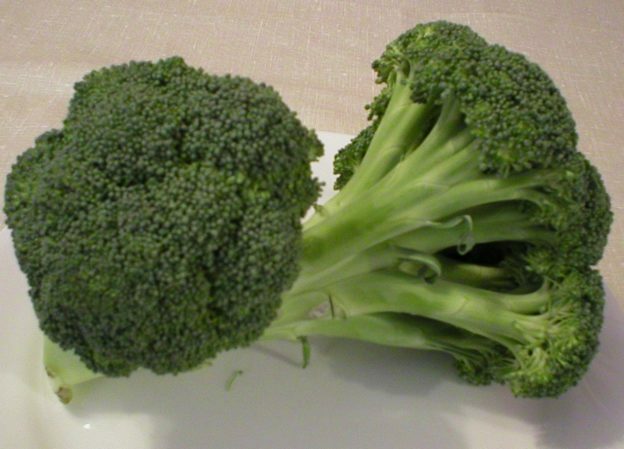 One cup of cooked broccoli has as much vitamin C as an orange! Broccoli also contains more protein than most other vegetables. It is very low in calories, with only 31 calories in one cup. Broccoli is high in sulforaphane (among other important compounds), a type of isothiocyanate, which is known to have anticancer effects. If for no other reason, this is one very important reason to include broccoli in your meals on a regular basis. The compound is found in greater concentrations in young broccoli sprouts than in the fully mature broccoli plant. So, if you have not tried growing your own broccoli sprouts, I urge you to try it! The sprouts are a delicious addition to any leafy green salad. Look for bright green heads of broccoli with tightly clustered florets. The more open the florets, the older the broccoli is. Look for firm, strong stalks (flimsy stalks that bend are older and becoming dehydrated). It should feel heavy for its size. Store fresh broccoli in the refrigerator and use it as soon as possible. It may be stored by misting the heads and wrapping them up loosely in paper towels or a cloth then placing that in a plastic bag to hold in the humidity. Use within 2 or 3 days. To freeze fresh broccoli it needs to be washed and blanched in boiling water for 3 minutes or steamed for 5 minutes. Immediately cool it in a bowl of ice water, then drain it well and pack into freezer containers or bags. It will keep well for about 12 months in the freezer. Dehydrating: Broccoli florets may be dehydrated. The stems may remain a bit tough with dehydration, so it is only recommended to dehydrate the florets. Blanch and cool them as above, then drain well. Follow the dehydrator manufacturer’s directions for the length of time and temperature for proper dehydration with your machine. Wash fresh broccoli well right before using it. If it has started to get limp (dehydrated), soak it in water for 10 minutes to crisp it back up. The stalks are often cut off and discarded. That’s a shame because they are just as edible and delicious as the rest of the broccoli. With a sharp knife, cut off (and discard) the very bottom end where the stem was originally cut from the plant. The woody outer layer of the stem can be trimmed off with a paring knife or a vegetable peeler. Once that is removed, the inner part of the stalk is very similar to the stalks attached to the floret tops. Why not eat them? Fresh: Fresh broccoli is usually available in most grocery stores. This is an excellent way to purchase the vegetable, nutritionally speaking, as long as the stalks do not show signs of age. Fresh Broccoli Eaten Raw: Raw broccoli contains the most nutrients and anti-cancer agents that the plant has to offer. When eaten in the raw state, we do absorb many of them. Some people have problems digesting raw broccoli, causing gas and bloating. If this happens to you, try cooking your broccoli in some way…steaming, boiling, roasting, etc. To steam fresh broccoli, cut into medium or small size pieces, place it in a steaming basket above boiling water and steam it up to 4 minutes. To get a boost of sulforaphane with the steamed broccoli, pair it with a raw source of enzymes that will produce the sulforaphane compound, such as horseradish, red radish, mustard, cauliflower, and/or arugula. Frozen: Frozen vegetables are a great convenience to those with a time crunch in the kitchen. The vegetables are usually processed shortly after being harvested which helps to retain a lot of their nutritional value (over fresh vegetables that have aged before being purchased). According to Prevention (https://www.prevention.com/food-nutrition/healthy-eating/a20457091/what-your-frozen-broccoli-is-missing/), the freezing process (briefly boiling the broccoli to blanch it) actually destroys the anti-cancer compounds in the vegetable. So we have a “catch-22” problem here, if you’re comparing convenience with nutritional aspects of broccoli. The choice is yours on which way to go. Perhaps include frozen broccoli at times when time is an issue and raw or steamed during other times. Over the years, broccoli has typically been eaten cooked…and over-cooked for sure. Today, we’re learning that less cooking is best when eating vegetables. This is also true with broccoli. Not only does less cooking help to preserve nutrients, but it certainly makes them more enjoyable with a better flavor and texture. Most people prefer “crisp-tender” over “mush” any day! Also, less cooking prevents the release of the sulfur odor and flavor that comes with overly cooked broccoli. So, more and more people are enjoying this fabulously healthy vegetable lightly cooked or even raw. Broccoli can be boiled, steamed, roasted, baked, sautéed, stir-fried, stir-steamed, put in a casserole, added to soups and salads, and enjoyed raw. So, it’s extremely versatile and well worth trying in a variety of ways to incorporate more if it into your meals! Some suggested flavorings for broccoli include: basil, cilantro, curry powder, dill, garlic, ginger, lemon, marjoram, mustard, nutmeg, parsley, oregano, sage, tarragon and thyme. This entry was posted in Food, Misc, Uncategorized and tagged All about broccoli, Broccoli 101 the basics, information about broccoli on February 28, 2019 by Judi. Steaming is a cooking method that has been around for a while. It’s easy to do and helps to preserve the nutrients that can be lost in cooking water when vegetables are boiled. So, if you don’t have a steamer basket, they’re an inexpensive tool that is well worth adding to your kitchen accessories. In the video below, I demonstrate how to simply steam fresh broccoli. This method can be used if you just want some lightly cooked broccoli to enjoy with your meal, add to a cold or warm salad, or prepare the vegetable for freezing or dehydrating. Enjoy! This entry was posted in Food and tagged how to steam broccoli, how to steam vegetables, steam fresh broccoli on February 26, 2019 by Judi. Some drawers will have a high/low humidity setting. This is a simple toggle lever that you slide back and forth that opens or closes a small vent, allowing air to flow or closing it off. Sometimes the closed vent setting will have a picture of a vegetable by the word “high,” indicating high humidity by closing the air vent. That same drawer may also have a picture of a fruit by the word “low” indicating the air vent is open allowing for low humidity in the drawer (refrigerator air is normally very dry). If you have a drawer that does not have a toggle lever, then by default it’s a high-humidity drawer. Fruits and vegetables contain a lot of water, so most of the humidity in the drawers comes directly from the food within. So, when the toggle lever closes off the air vent, it’s creating a highly humid environment for the items in the drawer. When the toggle lever opens the air vent, allowing refrigerator air to flow in and out of the drawer, it creates a low-humidity environment within the drawer. Some items should be stored in the high-humidity drawer, whereas others should be stored in the low-humidity drawer. So, what goes where? Some fruits and vegetables produce a hormone in the form of ethylene gas that is emitted as a ripening agent. These same foods often react to the gas that they produce by ripening faster. Other fruits and vegetables do not emit this gas. Some fruits and vegetables are sensitive to the gas, causing them to ripen faster than normal, while others are not. This is where the fruit ripening trick comes from where we can place an unripe fruit in a paper bag (such as a mature green tomato) with a ripe apple or banana. The gas emitted by the apple or banana will speed up the ripening process of the other fruit (ie the tomato) that’s in the bag. This works IF that fruit is sensitive or reacts to the presence of ethylene gas. Fruits and vegetables that are sensitive to ethylene gas need to be separated from the gas-producing foods. If not, the gas causes the sensitive foods to ripen and age faster than normal. By closing off the air vent of a drawer containing ethylene-sensitive foods, you’re protecting them from such gas in the refrigerator, while at the same time maintaining a highly humid environment helping to prevent the foods from wilting or withering. Examples of such foods include asparagus, broccoli, cauliflower, cucumbers, eggplant, green beans, greens (like chard, spinach, turnip and mustard greens), lettuces, parsley, peppers, squash, and strawberries. These include vegetables and fruits that are thin-skinned or leafy and tend to lose moisture easily. Ethylene-producing foods should be kept together and away from the foods that are sensitive to their gases. These foods should be stored in a crisper drawer with the air vent open, thereby allowing the refrigerator air to flow in and out of the drawer, creating a low-humidity environment. These foods tend to rot (such as apples) rather than wilt (such as lettuce). Some examples of these foods include: apples, apricots, avocados, ripe bananas, cantaloupes, figs, honeydew melons, kiwi, nectarines, papayas, peaches, pears, and plums. One simple way to know which food goes in which drawer is to remember this: “stop rot/low humidity” (to prevent rot, open the vent in the drawer creating a low humidity environment) “stop wilt/high humidity” (to prevent wilting or withering, close the vent in the drawer creating a high humidity environment). If nothing else, note that the words in each pair have the same number of letters in them (both “rot” and “low” have 3 letters; both “wilt” and “high” have 4 letters). This association may help you remember which items to put together. For instance, those items that tend to wilt from lack of moisture will need to go in the high-humidity drawer, with the toggle vent closed. Those items that tend to rot will need to go in the low-humidity drawer, with the toggle vent open. When preparing your refrigerator crisper drawers for newly purchased foods, make sure the drawers are clean and dry. It’s helpful to line the bottom of each drawer with either a couple layers of paper towels or a clean cotton kitchen towel, folded to fit the bottom of the drawer. The liner in the drawers will absorb extra moisture, keeping it from pooling on the food. This helps to keep the food dry which helps to extend the lifespan of the food. If you have fresh greens in a drawer, toss them around occasionally to prevent excess moisture from collecting on the leaves. Also according to the writers at TheKitchn.com, the drawers seem to work best if they are at least two-thirds full. That’s a good reason to keep plenty of fresh veggies around! Another important point is to keep meats, poultry and seafood out of drawers with fresh produce. That’s a serious potential for cross-contamination. The drawer in the middle of the refrigerator (if yours has one) is often labeled as a meat drawer. If you always freeze meats and do not keep meats in the refrigerator, you could designate that drawer (which usually doesn’t have a toggle vent) as a high-humidity drawer for whatever foods you need to store there. If you do store fresh meats in the refrigerator and do not have a designated meat drawer, consider keeping meats in their original packaging and storing them in a closed container in the coldest part of the refrigerator. Use them within a few days. The high-humidity drawer (with the toggle vent closed) should contain fruits and vegetables that are sensitive to moisture loss and ethylene gas, and tend to wilt or wither when they age. The low-humidity drawer (with the toggle vent open) should contain foods that are not sensitive to moisture loss, are ethylene gas producers, and tend to rot when they get old. By storing fresh fruits and vegetables properly, we can help to extend their shelf lives to the fullest potential, thereby saving money and wasting less food. This entry was posted in Misc, Uncategorized and tagged about ethylene gas in foods, how to use crisper drawer, how to use refrigerator drawers, vegetables and ethylene, what to put in crisper drawers, where to store fruits, where to store vegetables on February 24, 2019 by Judi. Whenever you buy fresh broccoli, cutting the vegetable up into bite-sized pieces can be easy, yet messy. The tiny pieces of the florets can get everywhere! Well, I found a way to cut broccoli without such a mess. It’s easy and requires no special equipment. Anyone can do it with ease! Here’s a video demonstrating how to do it. This entry was posted in Food and tagged can you eat broccoli stems, how to cut broccoli, how to cut broccoli without mess, remove woody layer of broccoli stems on February 23, 2019 by Judi. There is a big push out there now for using no added oils when cooking foods. I understand the rationale behind it, and am not disputing that at all. However as a cook, I realize that oils do serve some purpose during food preparation. So, I decided to test it out. I grilled a seasoned yellow squash on a table top grill. It was cut into four pieces, two to be tested with oil and two without oil. All four pieces were heavily seasoned because I wanted to see if the seasoning would stick to the squash without the added oil. All pieces were grilled at the same time on the same electric grill. The results surprised me and I learned some things along the way! Check out the video below. Maybe you’ll be surprised too! 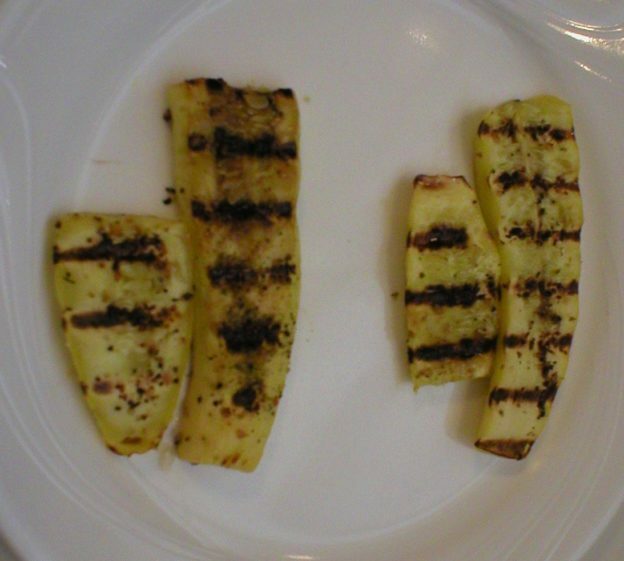 This entry was posted in Food and tagged do you need oil on grilled vegetables, no oil grilled vegetables, oil vs no oil grilled yellow squash on February 20, 2019 by Judi. If you’re not familiar with them, dealing with rutabagas can be a little intimidating. They’re round, so they are hard to stabilize to cut with a knife. They’re usually covered with wax (when bought commercially). AND, they’re dense and hard, so cutting them can be challenging. All this makes them a little scary for the kitchen novice. I found a simple way to cut them without using a vegetable peeler, which can be a bit awkward when trying to trim the peel from a round vegetable. This way is simple to me, but I will say that you should be comfortable with using a paring knife to use this method. Check out the following video to see how it’s done! This entry was posted in Food, Misc and tagged easily peel rutabagas, how to cut a rutabaga, how to peel a rutabaga on February 19, 2019 by Judi. Rutabagas are a vegetable that many of us are not familiar with. Yet, they are popular around the world. Are we missing something? Well, maybe! In researching about this lowly vegetable, I learned a lot about the nutritional and health benefits of including them in our diet. And they can be eaten raw or cooked, and prepared in a variety of ways. If given a chance, we’re all surely to find something to love about rutabagas! Check out my video below where I discuss rutabagas. Not only do I cover nutritional aspects, but how to select, store, and prepare them as well, including what herbs, spices and other foods go well with rutabagas. Give them a try! The information notes are below the video for your reference. Enjoy! They are only called rutabaga in the US. Everywhere else, they are called a “swede”. They are believed to have originated in Bohemia in the 1600s as a cross between a cabbage and turnip. In Sweden, they are often used in place of potatoes. Flavor: Nutty and sweet with a mild turnip-like flavor, with some bitterness. Rutabagas are member of the Brassica family (cabbage family), so they are high in antioxidants and anti-cancer agents. They are high in vitamin C which also helps the body absorb the iron that it contains. They are also rich in beta-carotene, potassium, manganese, magnesium, calcium, and more. Their nutrients help to form collagen and thyroid hormones, encourage wounds to heal, boost the immune system, and promote healthy bones, teeth, gums, and blood vessels. Look for purple tinged skin, which indicates ripeness. Avoid bruised or blemished ones and any with shoots growing out of it (indicates it is overripe). Smaller ones tend to be more tender and flavorful. Rutabagas can be eaten raw (as a snack, or grated into salads or slaws), but they are usually eaten cooked. Cooking releases a sweet yet savory flavor. They are only available fresh (as far as I know). Wash the rutabaga to remove any dirt. Slice in half, cutting through the center. Place on its flat surface and cut into ½” semicircles. Discard the first and last pieces. Remove outer skin with a paring knife; cut into cubes. Boil with a little sweetener for about 10 minutes. Stir-fry for about 7 minutes. Bake with a few tablespoons of water at 350F for 1 hour, until tender. Mash: Bring salted water to boil; lower heat and simmer for 40 minutes. Drain, mash. Butter and nutmeg or cinnamon can be added, to taste. 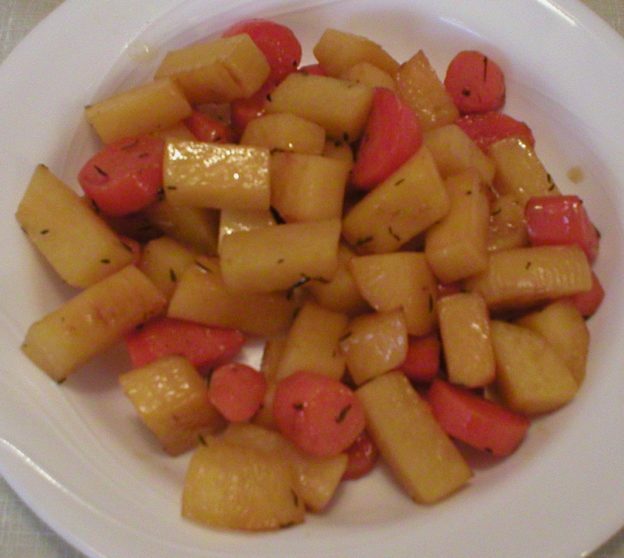 Rutabagas are typically eaten in a mixture of mashed rutabagas, potatoes, onions, and carrots with butter and salt. Rutabagas can be kept for months in cool, slightly humid conditions, and can be stored unwashed in the crisper of the refrigerator for up to two weeks. Cooked rutabaga can be frozen. Rutabaga can also be made into oven fries: Toss rutabaga spears in fat (olive oil, coconut oil, or even bacon fat or beef tallow) along with salt and seasonings of your choice (like garlic powder, dried thyme, and cayenne), then roast at 425F for 30 minutes. Roasted rutabaga is an easy weeknight side dish. Cube rutabaga and toss in olive oil with salt on a sheet pan. Roast at 425 degrees for 30 minutes. Add maple syrup and fresh thyme to accentuate rutabaga’s sweetness. 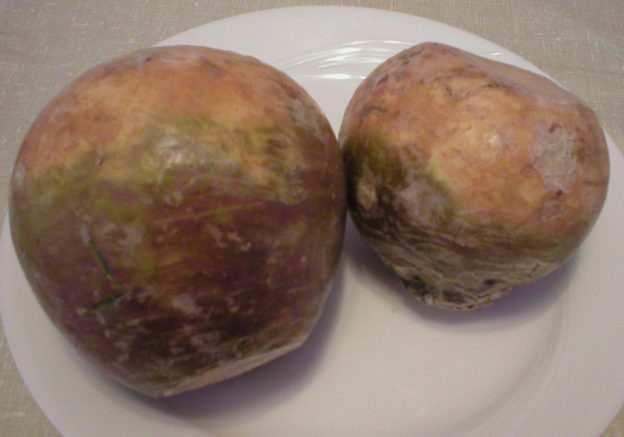 This entry was posted in Food and tagged About rutabagas, How to cook rutabaga, information rutabaga, rutabaga recipes, what goes with rutabaga on February 16, 2019 by Judi. Brussels Sprouts…you either hate ’em or love ’em. Well, I think if you hate them it’s because you haven’t had them cooked right. Years ago it was very common for people to cook vegetables until very soft in a big pot of boiling water. Then a large amount of butter (or margarine) was slathered on top to hide the flavor and they were then served. No wonder so many people hate this vegetable! Today, we’ve learned better. We now know other ways to cook vegetables to actually make them taste better while still preserving some if not most of their nutritional value. We need to take a second look at this loathed vegetable and give it the credit it’s due. In the video below, I discuss a lot of basic information about Brussels sprouts including nutrition tidbits, how to select, store, and prepare them, and list herbs, spices and other foods that go well with Brussels sprouts. And, if that’s not enough, I’ve included some links to sites that have some interesting recipes using the sprouts. My notes from the video are below, so you can enjoy the video and simply copy the notes for your future reference. Enjoy! Brussels sprouts are in the cabbage family. They are not baby cabbages, but a separate plant that grows on a stalk. These vegetables are delicious when not overcooked. The very component that gives them their sulfur smell when overcooked is the same chemical that gives them their anti-cancer properties. So…maybe we need to take a second look at these little gems! 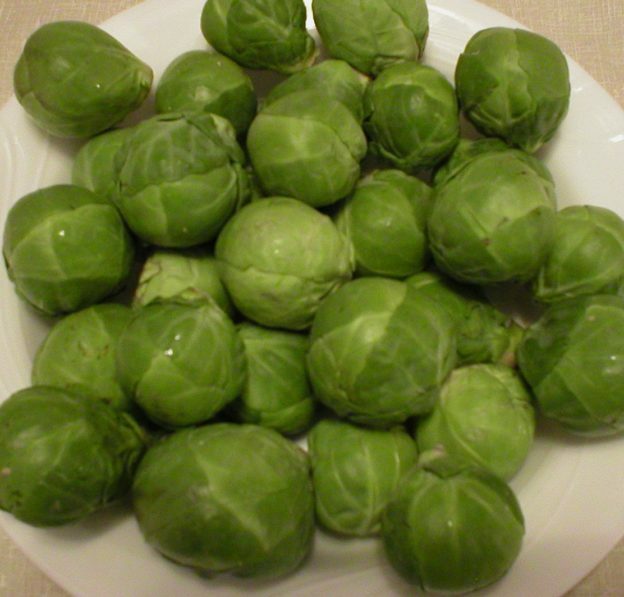 Brussels sprouts are an excellent source of vitamin A (beta-carotene), C, K, folic acid, iron, magnesium and fiber. They also contain a good amount of selenium. Because of their vitamin K content, you may need to limit the amount you eat if you’re on blood thinning medications. Look for bright green heads that are firm and heavy for their size. The leaves should be tightly packed. Avoid those with yellowing leaves or black spots on them. Smaller ones are usually sweeter and more tender than larger ones. Brussels sprouts are commonly eaten cooked, although then can be consumed raw. Cooking releases sulfur compounds that make them strong tasting and bitter, which is why many people don’t like them. When cooking with water, cook only for short times to prevent the strong, bitter flavor. Also, they should not be bitter when roasted properly. Sauté them for a short time to reduce bitterness. Brussels sprouts are usually purchased fresh, but can be found frozen in grocery stores. They are not available canned. Trim off the dry stem end. Remove loose outer leaves. They can be left whole, sliced in halves or quarters, or shredded for a salad or slaw. Sprouts can be boiled, steamed, roasted, baked, sautéed, stir-fried, and shredded for a salad or slaw. Halve Brussels sprouts, toss in balsamic vinegar, olive oil and seasonings. Sauté with sliced onions and mix with cooked pasta shells. Top with bacon bits. Marinate Brussels sprouts in BBQ sauce, or other savory glaze, spread evenly on a baking sheet; roast for 20 to 25 minutes. Serve as an appetizer on toothpicks or as a side dish. Steam until tender; drain and coat with butter. Toss in seasoned bread crumbs and cheese; broil until brown for breaded Brussels sprouts. Oven roasted Brussels sprouts (per Green Giant): In a bowl, toss to coat 1 lb Brussels sprouts, halved, in 2 Tbsp olive oil, ½ tsp salt, ¼ tsp pepper. Place on a baking sheet. Roast at 400F for 25-35 minutes or until nicely browned and tender. Serve and enjoy! When obtained really fresh, they can keep for up to a few weeks in the refrigerator. Store unwashed in plastic bag (in refrigerator). The sprouts can be frozen. Blanch for 3 to 5 minutes (depending on size); chill quickly, package and freeze in labeled freezer bags right away. They will keep about 18 months in the freezer. This entry was posted in Food and tagged Brussels sprouts 101 the basics, Brussels sprouts recipes, How to use Brussels sprouts, Make Brussels sprouts taste better, recipes using Brussels sprouts, What goes with Brussels sprouts on February 14, 2019 by Judi.